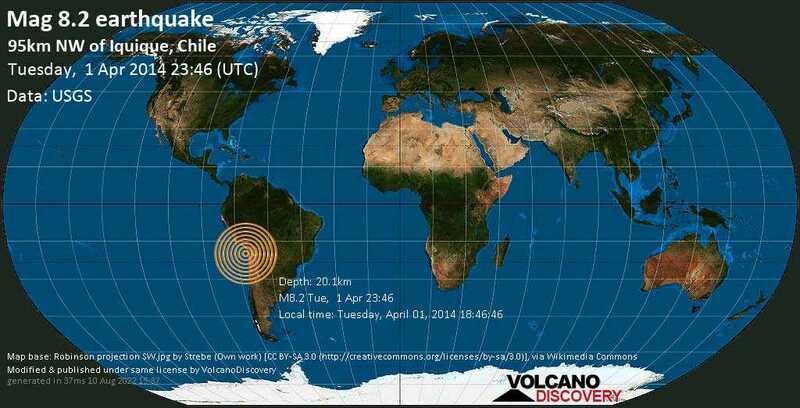 The magnitude 8.2 quakes occurred off shore the Tarapace coast, about 99 km NW of the city Iquique. A tsunami alarm was issued, and the coastal areas were evacuated. Fortunately, no large tsunami was triggered by the quake (which would have had the power to generate one). At least 5 people were reported dead and significant damage has occurred in the coastal towns, but much less than what could have been expected had the quake occurred under land or closer to the coast. According to the German magazine "Focus" 300 prisoners used the chaos resulting from the quake to escape. Numerous aftershocks have been occurring including a strong magnitude 7.6 quake. Many more aftershocks will likely occur during the coming weeks and months. Sanford, Florida / MMI VIII (Severe shaking): It was prefaced by many small quakes in the days preceding it. I was in the lobby of the Terrado hotel located in Iquique Chile. The experience was quite eye opening. The about 24 hours later another one hit. That was the time the decision was made to leave the city. La Paz, Bolivia (450 km NE from epicenter) [Map] / MMI IV (Light shaking): Even the bed mattress (with no casters) moved. We could feel the building swaying - we live on the 7th floor. No damage to the building structure. San Francisco California / MMI II (Very weak shaking): Sitting on couch, start feeling mild wavy shaking. Said to husband "we're having an earthquake" and looked at phone for time and it was 4:48pm. Taylors, South Carolina / MMI II (Very weak shaking): I felt the house shake while my family and I were eating dinner. 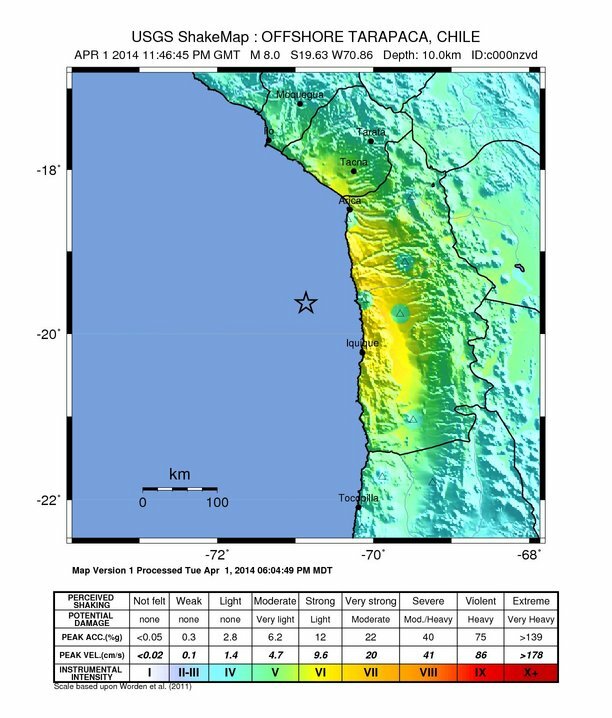 Arequipa, Peru (368.6 km NNW from epicenter) [Map] / MMI IV (Light shaking): Between "Light Shaking" and "Moderate Shaking". Slow but heavy sideways vibration lasting several minutes.